Available during SPRING, SUMMER & mild AUTUMN months. 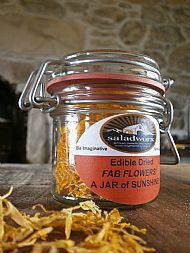 Dress Me Up Salad featured on this page is multi-award winning and Scotland’s Overall Product of the Year 2011. 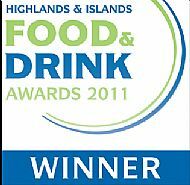 Scotland Food and Drink Excellence Awards, double winner 2011 (product of the year and product inovation of the year). 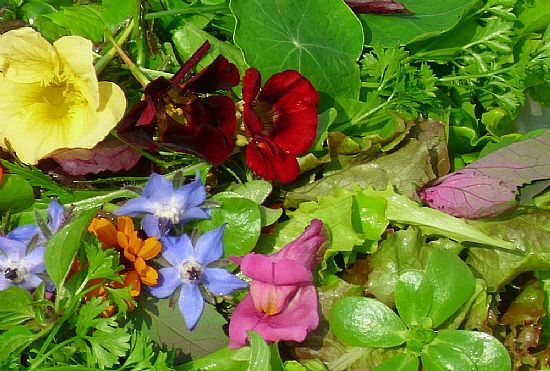 Our unique DRESS ME UP fine salad includes a mix of colours, assuring you of a quick and easy way to reach your "5 a day" and to make a significant contribution to your Recommended Daily Allowance of many essential vitamins and minerals. 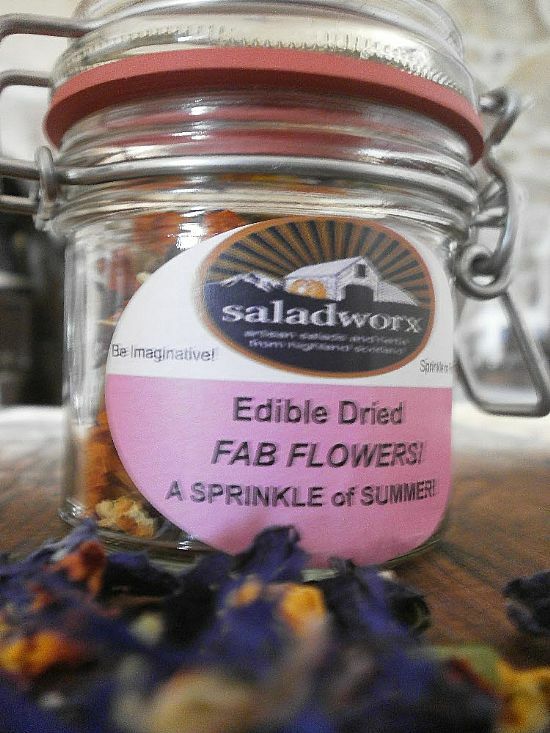 Our salad is fresher than many bagged alternatives, therefore the health benefits are greater. Naturally grown on our Highland farm, ensuring our leaves are free-from chemical residues. Why not try one of our dressings with our salad? A little dressing on salad improves the bodies ability to absorb some important nutrients. Packaged in clear hinged lid boxes protecting the product . These are fresh products and are packed and despatched to make sure they arrive in tip top condition so please provide a delivery date on at least one of your items. Other important delivery information below. 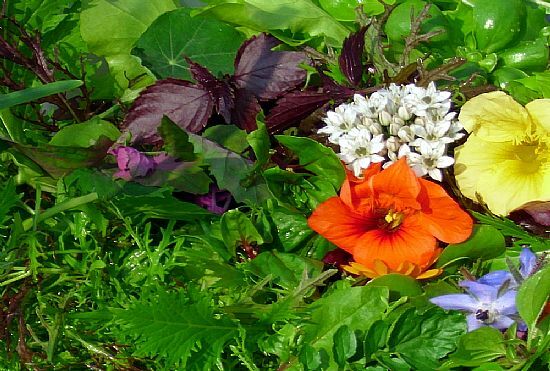 The finest, tastiest and largest selection of oriental leaves, lettuces, chicories, radicchios, endives, herbs, wild rocket and edible flowers we could grow. Used by celebrity chefs including James Martin, Albert Roux and by Master Chef contestants. Supplied to top hotels, restaurants and specialist caterers throughout the UK. We do not separate out the flavours, organise the textures, or limit the types of leaves, but bring you an array of up to 100 different varieties of seasonal treasures. Probably the best salad you will ever eat! Perfect with almost every meal, or as a meal on it’s own. 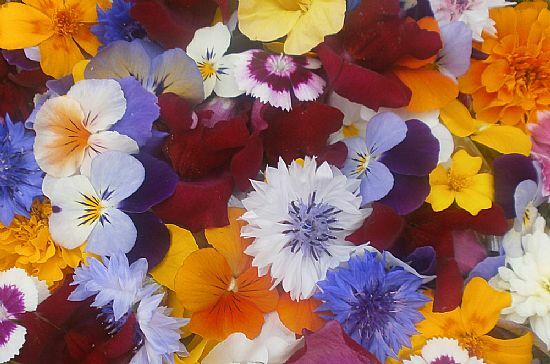 A super selection of seasonal, colourful edible flowers. 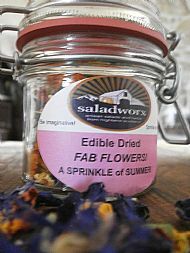 Perfect for that special occasion, sprinkling on salads, serving on canapés, decorating cakes and floating on drinks. 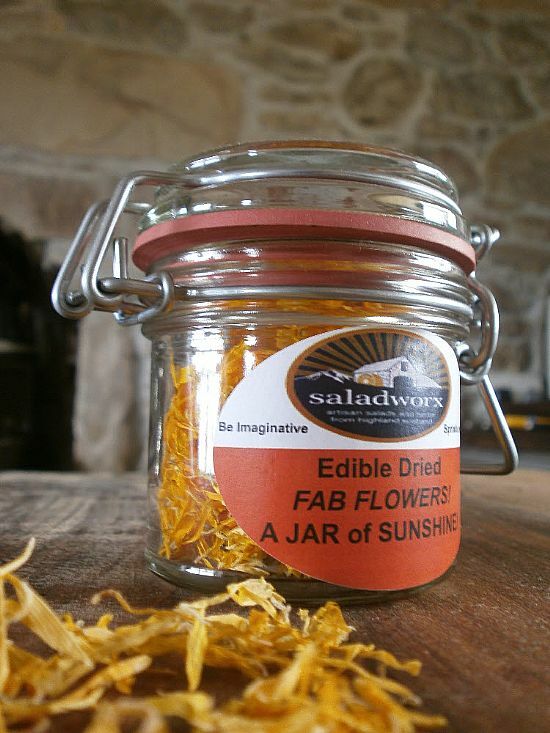 Dried edible calendula petals, perfect for adding to salads, fruit salads, ice, drinks & decorating cakes. They look like saffron. 125ml vol. Before adding a product to the cart, customers are required to please specify a preferred delivery date in the box provided, especially for perishable items such as salad. We will do our best to achieve that date. Please note that we are unable to process any order in less than 48 hours. We aim to keep our carriage prices as low as possible, passing these on to customers at around cost price. Normally we despatch orders on Tuesdays and Thursdays. Products requiring refrigeration are sent out on a next day delivery basis, using ice. Where products are sent on a 2-3 day service, extra ice is used. Once the package leaves us we cannot be held responsible for delays in delivery which may be caused through road traffic incidents or courier misdemeanours. For our ambient products, such as bottles of dressings/marinades/drizzles, ice is not used. We package suitably well to ensure safe transit. We send our smaller value and lighter parcels by Royal Mail and our heavier and higher value parcels by courier to keep costs down. Please enquire about competitive carriage charges to Europe, Scandinavia, Asia and elsewhere.